An example of a customer profile page on ContractorsCustomers.com. Even companies that’ve seemingly mastered Angie’s List and Yelp have woes with the sites. But a new website is giving the power back to the contractors. Contractor’s Customers, which launched in January, lets businesses write reviews on the customers they work with. 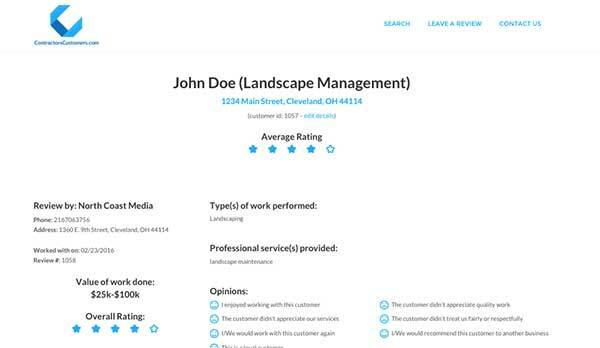 Before agreeing to a job, subscribers can search the potential customer by name or street address and read reviews left by other contractors as diverse as landscapers, electricians, limo drivers and more. The review is based on a one through five star overall satisfaction rating and an eight-question survey, which asks if the customer paid in a timely manner, paid the full amount, was courteous, seemed satisfied with the work and more. Contractors answer yes, no or neutral. Customers who’ve already been reviewed have a profile page, where the results of the surveys are compiled. If a customer doesn’t already exist in the database, contractors can create a page for him or her. Since the site only went live a month ago, it doesn’t have many reviews or users yet. To build its database, Contractor’s Customers is offering a free subscription for a limited time. Once its value builds, Carzo will start charging a subscription fee. Blog coverage and word-of-mouth referrals have helped Contractor’s Customers pick up steam, Carzo said. While he wouldn’t share the exact number of users, he did say he’s satisfied with the site’s growth in its first couple months. About half the site’s users come from the Boston region. The other half is spread out across the country, with the largest concentrations in southern California, Texas and Florida. Richard Maggio, co-owner of Derro Construction W.G. Maggio & Sons in Woburn, Mass., is one of the site’s early adopters. He said it gives contractors a warning or reassurance before taking on a new job. Winter is his slow time of the year. So, he’s only added and searched a few customers. As things warm up, however, Maggio plans to make a habit of checking up on potential customers and leaving reviews for those he’s already worked with. 2 Comments on "New website lets contractors review customers"
Excellant idea to help professional contractors who truly enjoy assisting and fulfilling improvements of betterment to consumers homes against customers who find exagerated excuses to avoid payment for services rendered. Sign me up please!